Now that the former head of the MTA is running for Mayor, it is worth asking: how can a man who turned the simple act of buying a train ticket into a Kafkaesque nightmare run a city as complex as New York? 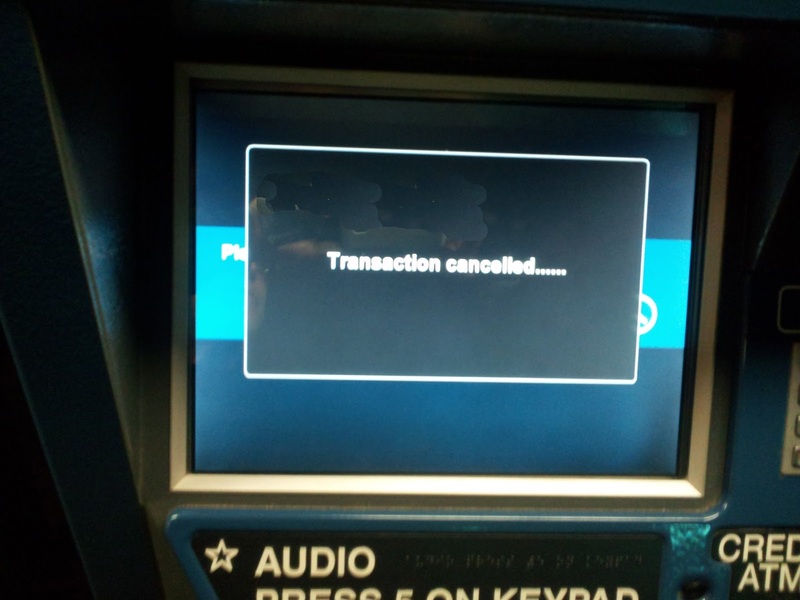 The MTA ticketing kiosk is a metaphor for everything that can go wrong when institutions go digital. It violates just about every rule of user interface - from ease of use it asks for too much information, confuses the user and faulting them for errors) to punishing the user with a surcharge and threat of eviction from the train. We can only hold our collective breaths and imagine how this would translate into City Mayoralty. Can a kiosk interface design be so bad that it causes thousands of people to miss their trains every day? Then, instead of fixing it, they punish people who give up in frustration by hitting them with a near doubling of ticket price on the train. Plus, they force them to use cash - or else! Institutions tend to deny design flaws and blame it on the consumer. You’ve probably heard about the MTA’s “tripping stair” in a Brooklyn subway. By being slightly higher than all the other stairs at the entrance this step caused people to fall all day long. The MTA ignored it until someone captured it on YouTube and they were forced to fix it out of embarrassment or potential lawsuits. 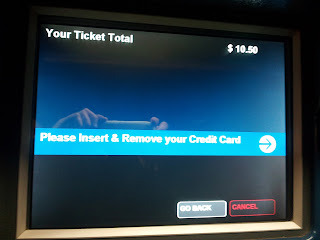 Now, look what happens when those same great minds got to work on a ticketing kiosk. Not only do they trip up the passenger but they pretty much guarantee that the untrained – no pun there! - will not make their train. 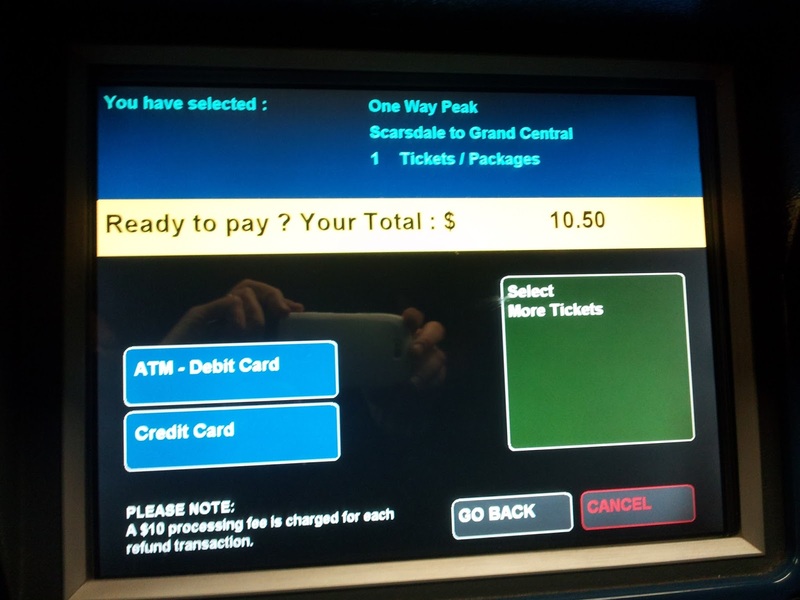 So many have given up and headed directly for the trains, that the MTA almost tripled the on-train ticket price. 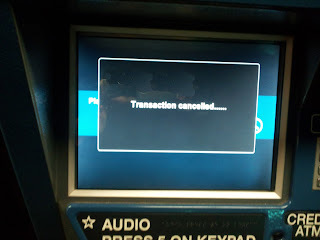 As an occasional user I never quite realized what a bureaucratic obstacle course their kiosks were until I almost missed my train while attempting to buy a ticket. One wrong choice and I was done. Add a few anxious passengers behind me along with daytime glare and it was virtually impossible to read all the choices and so I gave up and paid on the train, thinking it would be a few dollars more. 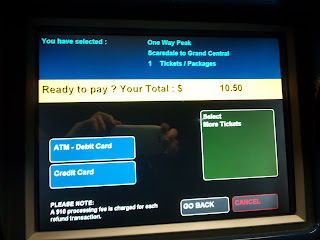 In fact it was $7 more – or almost twice the fare. And they only take cash. Ouch! Then, when I returned from Grand Central Station, a technician who happened to be servicing one of the machines began laughing at me when he noticed my bumbling: “They ask too many questions, don’t they,” he said. I was stunned. So they know this. “Well, don’t you tell them?” I asked, thinking just how compelling direct intelligence from the field would be. 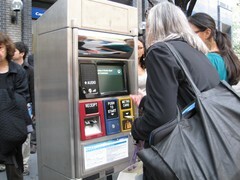 So what goes on at MTA and their digital interaction with ticket buyers. There is no express route on the kiosk just a path that may lead you to desperation. Here’s how the MTA bends the mind of passengers - in 8 excruciating steps. Step 1: So You Want to Buy a Ticket? The first screen delivers 5 choices. The problem is the largest box - and therefore the one you'd think is most important - has no useful information. It asks for "All other tickets." Obviously, they thought that by putting it at the bottom right of the screen, you'd get that because you would naturally be looking at a page from the top left, like any book or newspaper. But viewers don't look at screens the same way they look at books. They typically do an overall scan before focusing - from a visual perspective, the biggest box looks the one to start with. Once forced to go hunting for the right box, you get an idea about the code: Important stuff on the upper left, optional stuff on the lower right. Step 2: Where Would You Like to Go? Here they do something almost right. The choice boxes may look quite different from the first screen but they show signs of real intelligence: it guesses that I, probably want to go to the Big City and so it puts Grand Central up first. Where else would a suburban want to go? Believing that the system is working for me, I forget about the shift in style and make my selection. Just as you thought you were dealing with intelligent design - you are thrown back into the Dark Ages! In a masterpiece of misdirection it asks this seemingly innocent question: Peak or Off-Peak? Good question bout how would I know? Shouldn't it assume that I am most likely buying a ticket for the next train and then ask me to confirm? Instead, it offers to explain what constitutes Peak and Off-Peak. The print is small but OK, a small price to pay for help at your fingertips. But then they throw you a little slider: it tells you from the point of view of the arrival time at Grand Central and not from the departure time at your station. So, now you have to know the exact time of the next train's departure so you can do the math. If that means having to consult a schedule, then you'll quickly notice they are nowhere near this kiosk. Screen 4: So Did You Want "None" (After All That!)? In the next screen, it starts out by offering you nothing. Choice no. 1 is None. Luckily, they rush to explain that None actually means ticket only. In other words, they are saying things don't really exist unless you get a MetroCard, but sure, we'll throw you a rail ticket if that's what you want. Then, when you got the ticket you probably deserved, you find the ordeal isn't over. You still have to pay for it - and that is not so easy. Screen 5: Ready to Pay? Like a desperate salesman who won’t let you out of the room until you’ve bought more than you bargained for, they stretch out again with a big box asking if you want More Tickets. They even add a contrasting green background to pump it up. I am not sure who in their right mind would more of their tickets at this point, but at least we know to look for the key information on the left side. 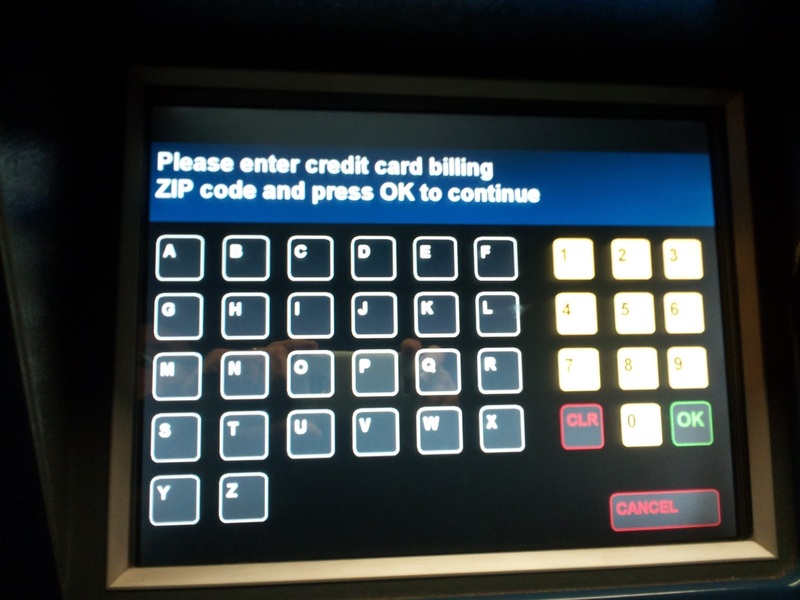 This time it is mid-screen and they make it easy to confuse Credit and Debit. If you do go off on a mis-step, recovery is not easy. The breathing from behind you will blast like furnace while their occasional sighs will break out a cold, cold sweat. Let’s say you got this far. You dodged the fake-outs, the headscratchers and the unwanted offers. You have selected the right kind of plastic and now, all you have to do is insert your card. You get a ticket, they get paid and the digital torment is over! If your eyes are week or the sun is glaring, you may not see this small print. Instead, you will see a massive keyboard. Since the important information is on the left you might wonder: why else would there be letters unless they expected me to type something? Will they need my name and address? Maybe a comment. If you were able to read the small type in the header and went straight to the number pad you'd be doing fine. Still, you just might wonder what the keyboard is for? After all, it does occupy 2/3 of the screen. So what Zip code requires letters? That would British or Canadian postal codes! And yes, I checked with the MTA, they put the alphabet keyboard in there on the off chance of a visiting commuter, say a Briarcliffe Brit or a Croton Canuck. Let’s just imagine the possibility that, after all this you didn’t hit the right key exactly. Perhaps it was the enraged gasps of the passengers behind you or the roar of the oncoming train. 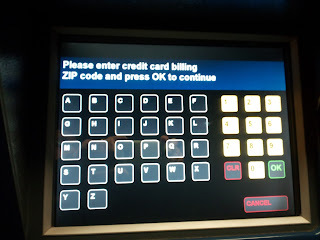 Let’s say you hit a letter instead of a number or you just didn’t put enough pressure on the keypad and so, after you hit “Enter” you get the above error message. You would want to correct it - but that is not the option here. Instead, you will have to go back to the previous screen asking you to dip your credit or debit card. Whoosh.....! The sound you hear is the train going by. Some people I have spoken with, buy their tickets in advance so they won't have to endure the pressure. Others head directly for the train, where they discover the penalty awaiting them or, if they have the option, buy a ticket from one of the few remaining live ticket clerks. Either way, the big question remains – is there a penalty because the interface is so bad or are they look for a way to increase on-train ticket purchases so they can fleece 'em with fat surcharge? Or is the MTA in the adult education business, fostering greater screen awareness with subtle brain teasers? Or, is this just an elaborate racket designed to get a payday from passengers? Are they trying to put conductors in harm's way, having to extract these penalties from exasperated passengers? Isn’t there a law against this kind of thing? Cruelty to users. Where are the design police? And if this is a racket, where are the Feds? As anyone with a smartphone knows, this is simply a matter of software and the user interface can be changed. So, why not? Alan Brody, is a digital maven and creator of Visual Daily. He runs the iBreakfast and is the author of Are You Fundable? We are constantly amazed by the quality of pitches we get at our monthly open event. What makes Startupalooza so interesting is that we find companies that don't show up on the usual radar. Companies like Ligandal Technology which looks like Apple-meets-Genentech in their garage days. They promise to reinvent medicine via genomic nanotechnology. Congratulations to the winner, Aajo the mobile wallpaper ad medium. Ligandal Technologies - the genomic nanotech editing company. Stellify Entertainment - A unique monetization and distribution platform for live events. DefenCall - StaySafe smartphone panic button app platform. We will be back in September with a Startupalooza and the curated pitching event, the iEvening. investors rate Startups and what they can do to improve your funding prospects. We also offer an incredible free workshop (for iEvening attendees) that helps you work through these issues.